It’s never too soon to start building your emergency kit for your car or reviewing the one you have now, regardless of the time of year or where you’re located. Preparing yourself for a roadside emergency requires a different approach than building a survival kit for your home or office. You have to include different items not needed for home survival and need to make sure that your kit is protected well enough from any kind of extreme temperatures if it’s kept in a hot car. Whether you are commuting to work in heavy LA traffic or live out in the countryside, every vehicle owner can benefit from stocking up on emergency kit items or building a bug out bag. Sometimes help takes hours to reach you, or maybe you won’t have cell phone service to call for help. Building your car emergency kit with the right items can help you get back on the road as quickly as possible, instead of being stranded outside in potentially dangerous weather. Take the time to put these items together, because they could help save your life. 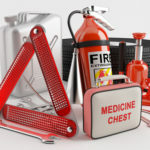 Some of these items might seem like a no-brainer, but if you ever find yourself in a roadside emergency, you’ll be glad you have them. Some of the essentials listed below will not be applicable to your situation, due to whatever type of vehicle you drive, or who rides in your car with you, or where you live, and so on. Obviously, you don’t necessarily need thick winter boots if you live in sunny California, so tailor your own car emergency kit to your individual needs. Start Building Your Kit Today! If you use this handy list for your car emergency kit, you will greatly increase your chances of survival. Again, there are of course some items on this list that you won’t need, depending on your vehicle and the climate of your local area. These are a lot of items and will take up quite a bit of space in your car, so you determine what’s best for your individual needs. Putting any kind of kit together is better than not having any kind of emergency items at all, so getting started is always a good idea. If you have children or others who ride in your vehicle with your regularly, you’re going to want to build your car emergency kit for their specific needs as well. This checklist is simply a recommended jumping off point for those who are wondering what to include with their essential car emergency kit. Don’t get stranded in a roadside emergency without the right items to keep you and your family safe. Build your car emergency kit today. While these essential items are easily accessible in most stores, putting one of these kits together can be very time consuming and expensive. Not everyone has the time to gather together a few dozen items and put them all together in a car emergency kit. At More Prepared, we solve that issue for you. We offer high-quality car emergency kits that are perfect for any vehicle owner who is concerned with emergency preparedness on the roadways. These kits take the hassle out of putting one together on your own. Each kit has enough food and water to last you up to 72 hours and can withstand extreme temperatures in the trunk of your car for 5 years. Choose from 1, 2 or 4 person kits, and durable backpacks for storage are available as well. You can also customize your kit as well, feel free to give us a call today with any questions.